My post about enjoying a Bad Boys Bakery cake from Caffe Nero in Brixton ended up attracting thousands of page views, and I received quite a few emails from folks asking about availability (it seems I was lucky enough to sample an early trial batch). The good news is that the cakes are back in stock – straight from Brixton Prison – and the even better news is that they are just as delicious as the first time around. I spoke to staff at Caffe Nero and they said that the cakes had proved hugely popular with customers – so get in there quick before they go! We are proud to be supporting the Bad Boys’ Bakery prison work scheme pilot at HMP Brixton. Having been approached by Gordon Ramsay and presented with the product we found it to be of excellent quality, and most importantly, delicious! 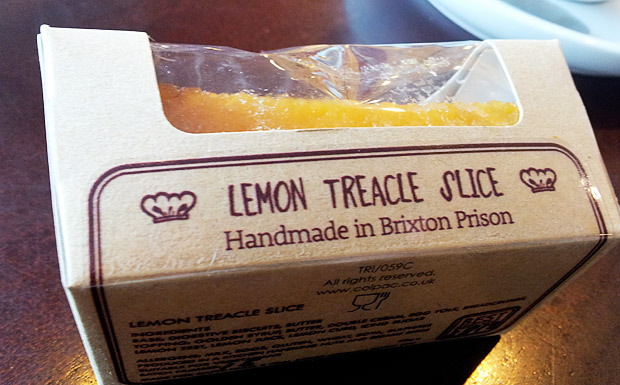 You can find the Lemon Treacle Slices in 11 of our stores closest to the Prison (Brixton, Wandsworth, Battersea and Clapham area) whilst stocks last. The trial has been going well; good sales, positive customer feedback and the consistent quality levels all indicate a real chance for the pilot scheme, and we wish the Bad Boys’ Bakery every success in establishing itself as a self-sustaining social enterprise. Clapham Junction, Clapham High St, Balham, Wandsworth Southside, Earlsfield, Battersea Rise, Brixton Morleys, Tooting, Lavender Hill, Streatham High St and Bellevue Road. The company have also helpfully published the recipe for the cakes. Read on and have a go! Place the biscuits in a food processor and blend until you have a smooth crumb. Melt the butter, then stir into the biscuits. Press the biscuit mixture firmly into the base of a 20cm square tin which has been lined with baking parchment. Place the golden syrup into a saucepan along with the butter and allow to melt GENTLY. You do not want this to boil. Once the butter has melted take the pan off the heat and stir in the cream, breadcrumbs, egg yolks, lemon zest and juice. Stir well. Once the base has cooled, spread the lemon curd onto the base. Pour over the breadcrumb filling and then place into the oven to cook for 25-30 minutes or until firm to the touch. Remove from the oven and allow to cool completely before cutting. Mix together a little icing sugar and lemon juice until you have a thick paste. 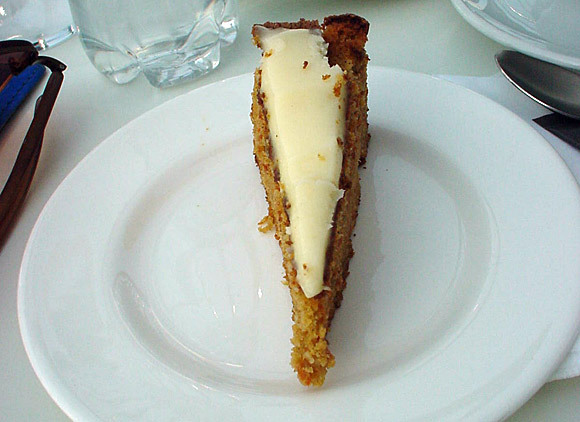 Place it into a piping bag and pipe over the top of your slices. Read more about the story behind the bakery and Gordon Ramsay’s TV collaboration with Brixton prisoners, ’Gordon Behind Bars,’ here and discuss the Bad Boys Bakery on our discussion thread. 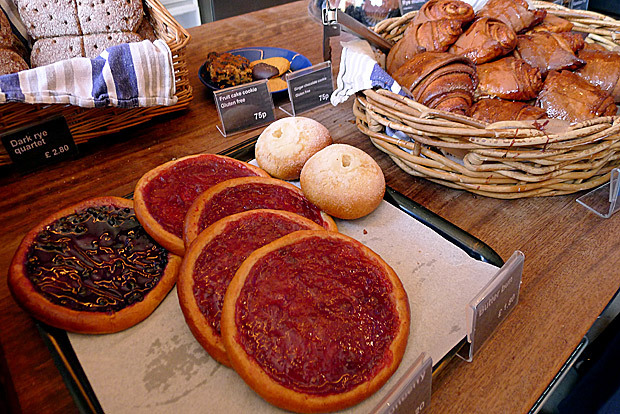 We bite into a Bad Boys Bakery cake from Brixton Prison… Cinnamon buns to die for at the Nordic Bakery, Golden Square, Soho, London W1 London’s meanest slice of cake? (Tate Modern) Offline returns to Crystal Palace! 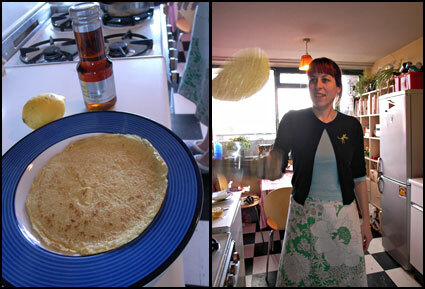 Pancake flippin’-tastic! 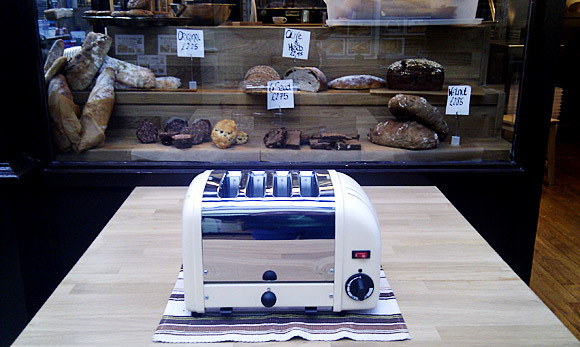 The quagmire returns – rain in London Breads Etcetera opens in Brixton Village Federation Coffee, Brixton – London’s finest coffee? I am in Australia and am currently watching Gordon behind bars. What a great idea and fantastic show. Well done boys !!!!!! Me too, Sue!! Brilliant idea, perhaps our Aussie prisons should take a leaf out of their book as well?! Well done you blokes ! Nice going Gordon Ramsey , for a bloke I’d once detested you’ve certainly changed my mind on you & how you think Gordon, it’s fantastic to see your compassion shining through for those blokes! I sincerely wish each & every one of the ” bad boy bakers ” well ! Also from Australia and I think it’s there last episode, I’ll have to cook it up and see how it tastes, there should be more prisons doing this, make the guys feel proud and even give them a chance to find there artist cooking side!! They’ve got these back in stock again at the Caffe Nero in Brixton – I’ll pop out later and have one for all you Australians visiting the site! Gordon Ramsay gave these guys a future & Caffe Nero should be proud they took the slices on, what a fantastic idea. I live in Perth, Western Australia and I’ve just watched Bad Boys Bakery story on TV. Absolutely fantastic idea, great work and well done from “down under”. You should all be proud of yourselves. 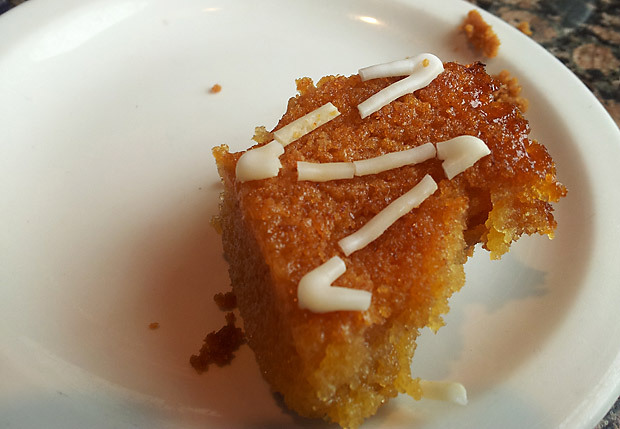 Just wish we could get your Lemon Treacle Slice in Oz. i’m from Canada. this is the second episode i’ve watched. Gordon i think what your doing is amazing. it shows the boys they can accomplish something other than bad reputation. if your products were available over here i would definitely support the Bad Boys Bakery. way to go boys:) keep up the good work! FATASTIC! Having a purpose is so important for people. I wish there were training programs out there for people age 55+. Nobody seems to want to give me a job. Much success and I hope this program carries on and we are given updates. Thanks! I am in Vancouver BC Canada and just finished watching the end of this show. 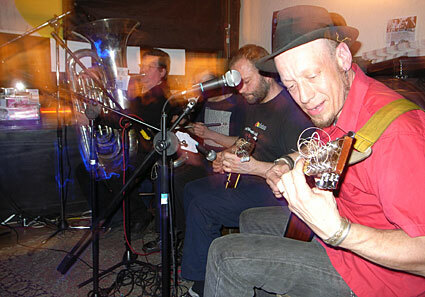 Awesome all round on everyones part. It is really “giving back” and the ripple affect of it. 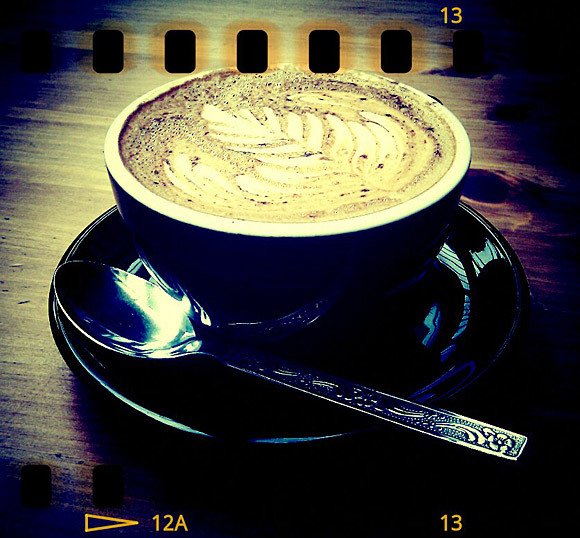 Can’t wait to go to the UK and visit Cafe Nero just to eat one and support this. Gordan, well done on a amazing idea that you dedicated your self to and stuck to it. You made a change. I gues I better stop talking about it and start one of my own. I just saw the last episode here in the US. It was an incredible idea. I know we have pilot programs like this in the US, but they don’t have someone of Ramsey’s stature pushing the government to support them. I wish we did. Well done, Mr. Ramsey and good luck gentlemen on your journey back into the mainstream. i actually live in san diego california. i just finished watching the series, and was curious as to if it was still in operation. i am pleased to see it is! It is a wonderful program, and as the one prisoner said, it would be good if there was some kind of trade schooling in the prisons, because it finally teaches them a trade they can make a living off of. i totally agree. Heck, have half bake tarts, and the other fixing cars, or heck, even building them! From Washington D.C. – Just finished watching the last episode of Gordon Behind Bars and am so impressed. 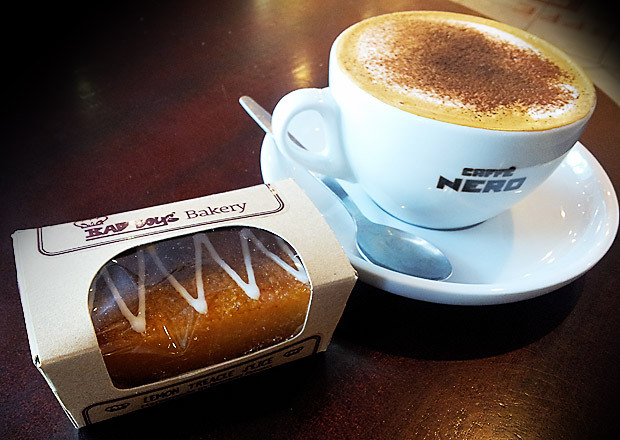 I’d love to try one of the lemon treacle tarts and hope to stop by Caffe Nero’s when passing through London. The program is wonderful and it’s nice to see the light in the men’s eyes. Praying for Paul Wyatt. A little plug – We’ve gone into the prisons here in the US with the Art of Living’s Stress Management And Rehabilitation Prison Program. We’d love to help. Can I order them for shipping to Virginia? I’m dying to try them! Great idea by Gordon Ramsey! He is such an inspiration to all of us to NOT give up on humanity. Gordon Ramsay for President!!!! South Africa needs you! Même si cela date de 3 ans, mais je suis contente que Gordon ramsay , à su prendre le problème à la racine pour faire évoluer les choses et donner sa chance à d’autres je le félicite , parce que il reste umble malgré tous, je le respecte beaucoup pour cela.